Author and educator Irma Simonton Black was born on June 6, 1906 in Paterson, New Jersey. She received an A.B. from Barnard College in 1927, majoring in English and mathematics. While at Barnard, Black wrote for Barnard Barnacle, the college’s quarterly magazine, and Barnard Bulletin, the college newspaper. Following college, she studied at the Bureau of Educational Experiments (BEE), where she completed the teacher training course. She also did graduate work at New York University. She began teaching at the Harriet Johnson Nursery School, the Bureau of Educational Experiments nursery school, in 1931. 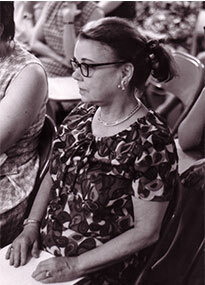 She also worked in the Research Division and as a faculty member teaching children’s literature. Black was an author and editor of The Bank Street Readers, the first multicultural, multi-ethnic readers. The Readers featured recognizable children in urban settings dealing with everyday situations. She also edited Bank Street’s Early Childhood Discovery Materials and Discoveries series for intermediate grades that allowed students to progress from group reading under teacher supervision to individualized reading without a teacher. Black was the author of more than twenty children’s books, both fiction and nonfiction, and wrote three non-fiction books for adults. She and Lucy Mitchell were also the editors of Believe and Make-Believe, stories by Bank Street writers. In the 1940s, she wrote a weekly newspaper column called “Life with Junior.” Through the 1950s and early 1960s, she contributed a monthly column, “You and Your Child” to Redbook magazine, articles on art for children to Art in America magazine, and a column, “Books for Young People,” to Saturday Review magazine. She also contributed many articles and reviews of children’s books to popular and professional publications, including Progressive Education, Ladies’ Home Journal, Parents’ Magazine, Women’s Day, The New York Times Book Review, and Journal of Pediatrics. She also wrote for a radio program, The Baby Institute that featured Jessie Stanton and Benjamin Spock, and contributed to a NYC television program, Winkie Dink. Among her professional honors and affiliations were: the National Association for Nursery Education, Phi Beta Kappa, and the Barnard College Alumni Association. She married attorney James Hammond Black in 1934, and the couple had a daughter, Constance Kirkland Black. Constance Black married Earl E. Engle and they have two sons, James Simonton Engle, an artist, and Douglas Harrison Engle, a professional photographer. At Irma Black’s untimely death in 1972, Bank Street College of Education established the annual Irma Simonton Black Award for Excellence in Children’s Literature with the encouragement and support of her family. The Award was presented in Irma’s name only until 1992, when it was renamed the Irma Simonton Black and James H. Black Award for Excellence in Children’s Literature in recognition of his ardent support of the Award.